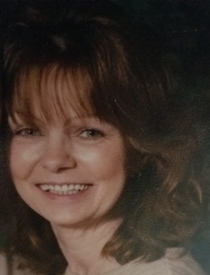 Funeral services for Dolly Degano, 62, will be held at 5:00 P.M. Monday, January 28, 2019 at The Gathering in Douglas, Wyoming. Dolly Degano died Wednesday, January 23, 2019 at the Memorial Hospital of Converse County in Douglas. Dolly was born Friday, April 20, 1956 in Mount Holly, New Jersey and was adopted and raised by Howard Elwood and Betty (Kurtz) Hillman. She was raised and educated in Mount Holly. She married Dave Gudonis in 1971, to this union a daughter, Dee, was born, they later divorced. She and Jess Cooper moved to Wyoming in 1976 and were married in 1977. She and Jess were married for 19 years and a granddaughter, Desiree, was born during this union. They were divorced and she was married to James Degano in May, 2000, and a grandson, Hunter, and great granddaughter, McKenzie, were born during this union. Dolly was diagnosed with stage three ovarian cancer in 2014, while working at the Memorial Hospital of Converse County for 20 years. Because of her health issues she retired in 2016. She loved her family, friends, shopping QVC, dogs, home, and gardens. She is survived by her husband, Jim Degano; daughter, Dee Siers; grandchildren, Desiree Wisecup and Hunter Siers; great granddaughter, McKenzie all of Douglas; siblings, Allen Hillman, Mary Tuttle Eckel, Susan McCarthy, and Alton Tuttle all of New Jersey; and biological father, Walter Tuttle of New Jersey. Dolly was preceded in death by her father, Howard Hillman in 1998; mother, Betty Hillman in 2004; son-in-law, Ted Siers on July 3, 2017; sister, Jean Clemens in 2012; and brothers, Jack Hillman in 1972 and Bobby Tuttle in 1997. In lieu of flowers a memorial to the Angel Foundation in care of Rocky Mountain Oncology, 6501 East Second Street, Casper, Wyoming 82609 would be appreciated by the family.